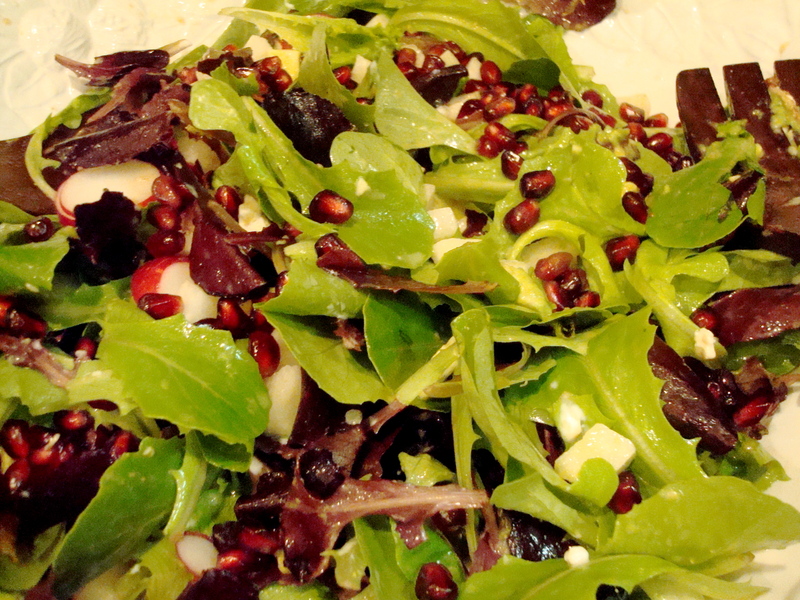 Pomegranate-studded salad, adapted from the Seasons of My Heart cooking school in Oaxaca. My dad's camerones con salsa verde, based on the recipe he learned while working at the Casa Mexico, in Cambridge, Mass. We wanted to prepare a festive end-of-year feast for Dan’s Aunt Amy, a native New Yorker visiting us here in Charlottesville. I knew Mama Mexico was one of her favorite Manhattan restaurants (she loved their freshly mashed guacamole and complimentary birthday tequila shots, straight to the mouth from the bottle). Sadly, Amy told us her Upper West Side haunt has just closed. But we managed to prepare a Mexican meal to rival the restaurant’s tonight. To start, Dan made guacamole that’s hard to mess up, if you have ripe yet firm avocados on hand. Amy brought a marvelous, umami-sweet Cabot Creamery Clothbound Cheddar, with a granular, Parmegiano-Reggiano-like texture. I made this Stuffed Dates (with Stilton blue cheese and chopped pecans) recipe we saw in the Washington Post. Dates and cheese are a great appetizer pairing, but here the balsamic vinegar made the stuffing mixture look inappropriately like chopped liver. Still, it tasted good. For our salad, I adapted the pomegranate-studded one we had made in our Seasons of My Heart cooking class while vacationing in Oaxaca in 2005. The dressing combines pomegranate molasses, fresh grapefruit juice, olive oil, garlic, of course salt and pepper, and I added a drop of my friend’s Weinsteiger Mustard. The salad consists of mixed greens, diced jicama, goat cheese, avocado, sliced radishes and ruby-like pomegranate seeds. Click here for a Baltimore blogger’s fine tutorial on how to de-seed a pomegranate. For our main course, Debbie baked up some cheesy chicken enchiladas with red sauce. I made my dad’s famous green sauce with shrimp. Click here for his recipe, which I blogged about back in early September, when local peppers and tomatillos were still in season. 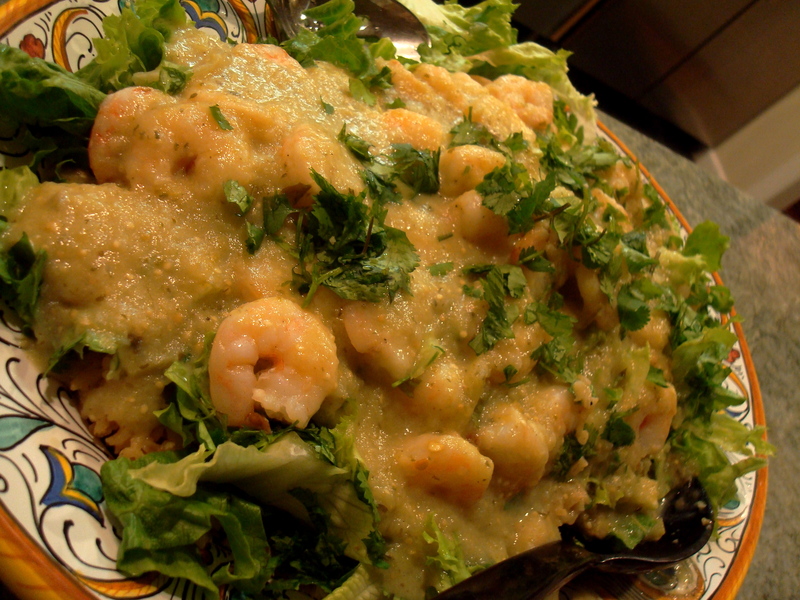 To serve the dish, pile Spanish rice on a platter and top it with sliced lettuce and roasted or steamed shrimp, then ladle on the salsa verde and garnish with chopped cilantro and possibly sour cream or grated cheese if you wish. Delish! And you don’t need to buy Spanish rice in a box. All you do it fry some minced garlic in canola oil, add your desired white rice amount and sautee, add some saffron (optional), some red salsa, and possibly spices like cumin, Mexican oregano or chile powder, and then chicken broth or dissolved bouillon equal to the amount of water the rice requires to cook. Cover and simmer as directed. It’s that simple. Much more impressive than boring white rice! Yum! Looks like a great meal! Our buddy Jim read somethwere that Mexican and Thai flavors are closely related-and intensely flavored savory-caliente-tart-sweet combos are the best part of each in my book. Tamarind, cilantro, peppers, citrus overlap. Didn’t most of these spice combinations originate in India and move out from there? Interesting, would have to research those flavor combinations. The Flavor Bible might be a helpful resource. It’s a cool book!